I understand that people are pissed. I understand that Solidere’s Downtown Beirut has become a blocked off part of the city that seems to cater to the fortunate and wealthy, void of the majority of typical Lebanese citizens and taxpayers. 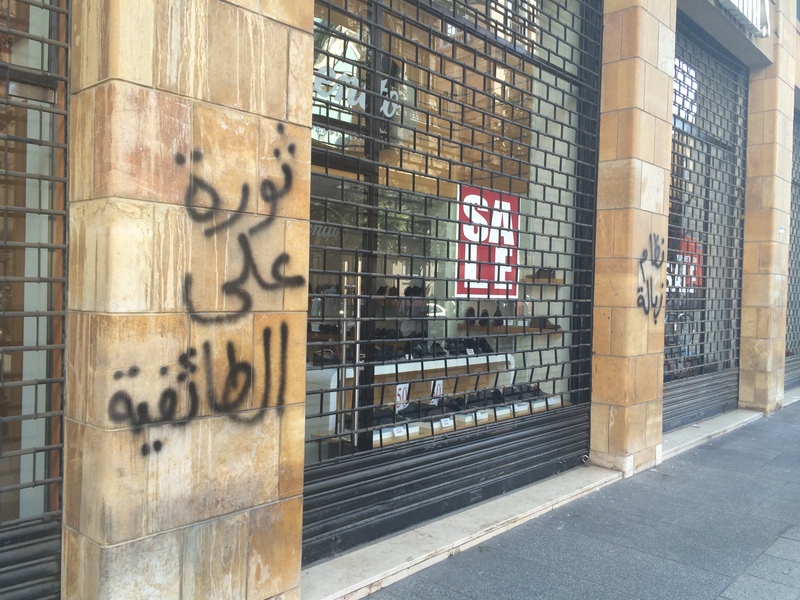 I understand that the #YouStink movement has given people an outlet to release all their pent up grievances. But the resentment toward this place is because it is supposed to be for all the people, not just the ones who can afford the strip of shops on Foch. That is why I can’t understand why it seems okay to vandalize the properties there. Defacing the statues and buildings isn’t going to serve anyone. It is still our central district and we should ask for rights by proving that we are respectful of the historical significance of the squares, open public access, and the collective heritage of the area. Doing the opposite will only prove their claim that we are a people undeserving of our own metropolis. Please don’t deface our face to the world. We should reclaim it, bring it back to what it is supposed to represent – a hub for commerce, tourism, and history. We can take it back or we can let it continue to be a beacon of inequality. Once again, it’s up to the people to decide. Cannot agree more. I fully support what the authentic people of Lebanon are doing in Beirut, but up until some allow themselves to violate other citizens’ rights. I agree that we could’ve done without the graffiti and slogans on the walls. But that’s a minor issue when compared to the organised chaos around downtown, with all the barbed wires, concrete walls, fences and armed personnel. For me this illusion of safety is much much worse than any sprayed wall or statue. Absolutely. I’m not saying that the graffiti is a bigger issue than what is really being tackled. I just wish that it didn’t have to be so destructive.